How do I change my computer time zone settings? From the Start menu, navigate to your Control Panel. A window with icons and text will open. Double-click "Clock, Language, and Region". Under "Date and Time" and click "Change the time zone". A window displaying a clock will appear. Below the clock, you will see a your current time zone and a "Change time zone" button. Click on button and select a new zone from the drop-down menu that appears. The drop-down will change to display your selection. Once you have completed the above steps you may need to re-start your computer to allow the changes to take effect on Yondo. Log back into your Yondo account. 1. Click on the Apple Menu in the upper left-hand corner of your screen and select "System Preferences." 2. Click on the "Date and Time" icon in the Preferences panel to activate the "Date and Time" preferences. 3. Click on the "Date and Time" button at the top-center of the panel. 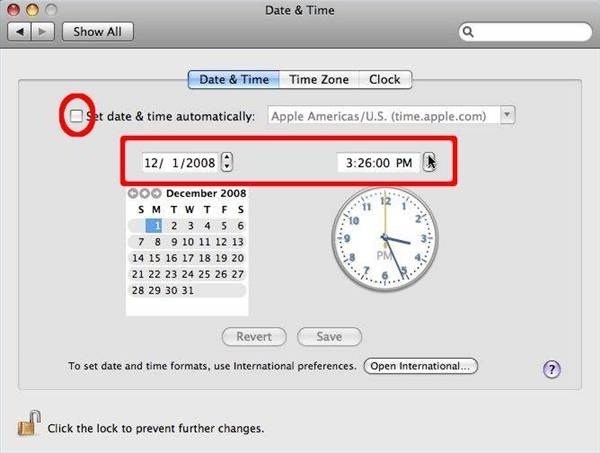 The date and time can be automatically adjusted from a network time server, if your Mac is connected to the Internet, by checking "Set Date & Time Automatically." Your computer will adjust its internal clock to a central network server. 4. Set the date and time manually. If you are not connected to the Internet, de-select the "Set Date & Time Automatically" check-box and adjust the date and time using the date and time adjustment arrows above the calendar and clock. The date can also be selected by clicking on the corresponding calendar day. The time can also be adjusted by clicking on the time displayed above the clock and entering the correct time using the numbers on your keyboard. 5. Select your current and correct time zone on your computer. To select the time zone, click on the "Time Zone" button at the top of the "Date and Time" panel. Click on the world map to select the city nearest to your location or use the pop-up box to select the closest city to your location. When you've completed your date and time adjustments, close the "Date and Time" preference panel to save your settings. 7. Once you have completed the above steps you may need to re-start your computer to allow the changes to take effect on Yondo.